The greatest pleasure in life is making a child smile. 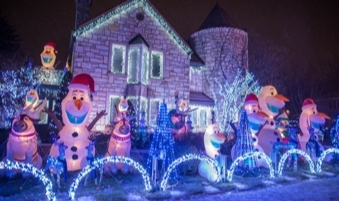 Dream Land, Is a house decorated like a magical kingdom at Holiday time. This year’s theme is mainly about Mickey & Minnie Mouse, while also having Frozen, Star Wars, The Grinch, Paw Patrol, Snoopy and Minions surprises in store for you in the backyard. Dreamland is a whimsical world offering a hundred or so inflatable decorations as well as hundreds of thousands of lights. The decorations light up to the sound of upbeat music, for a riveting sound and light show for children and grown-ups alike! Drop by for a visit, it’s free. The charitable event of the Plan A Foundation is fully paid for by Plan A - owner-manager of rental properties. Starting November 30, 2018, the light show will be presented every day, at 6, 7, 8 & 9 PM, until January 10, 2019. The lights are open from 4 PM to 11 PM.